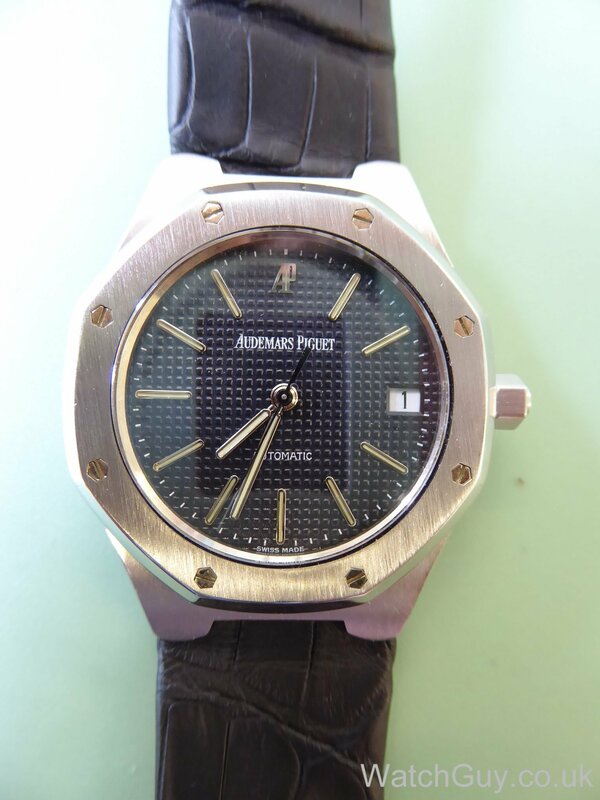 Steven sent in his Audemars Piguet for a service. 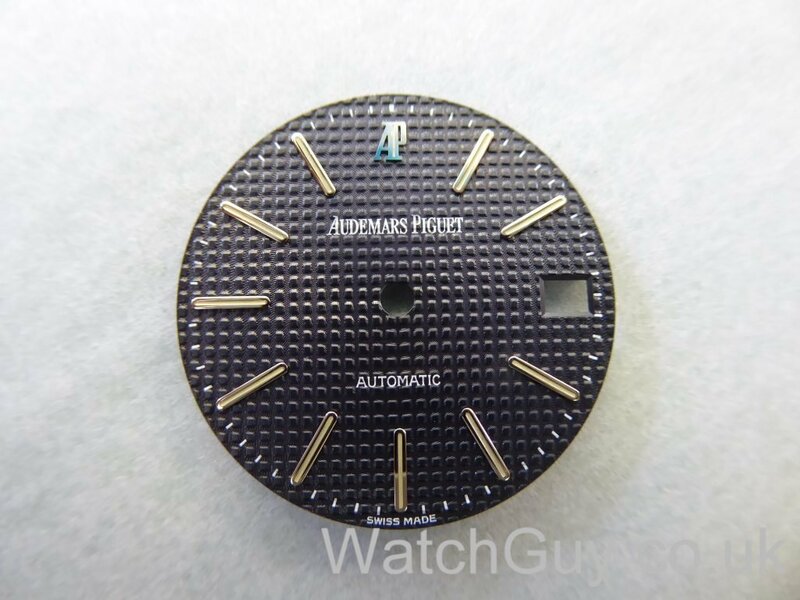 The watch doesn’t have a lot of power reserve, and isn’t the most accurate, either. Time for a service! This certainly needs addressing. 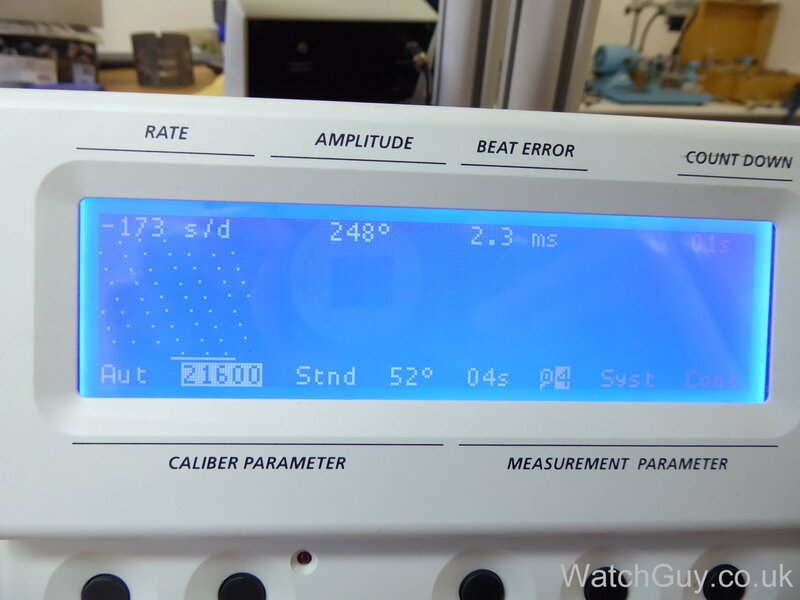 The amplitude is a bit low, and the beat rate and beat error are way out. 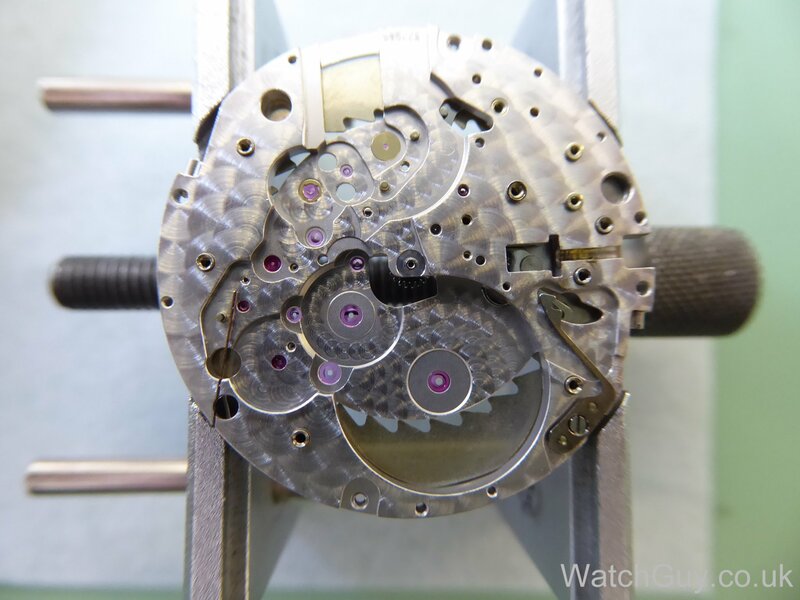 The case construction of the Royal Oak is rather unusual. 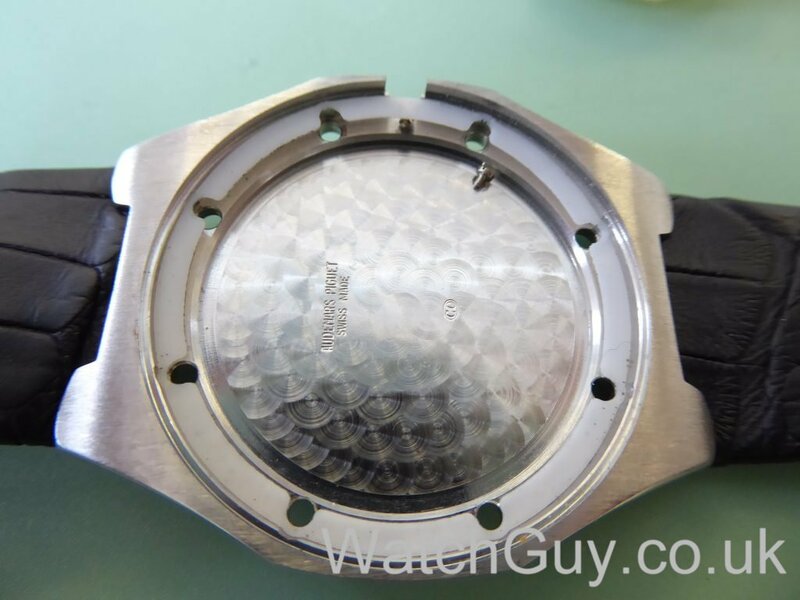 The bezel is held to the case with 8 screws, and the case is monocoque. 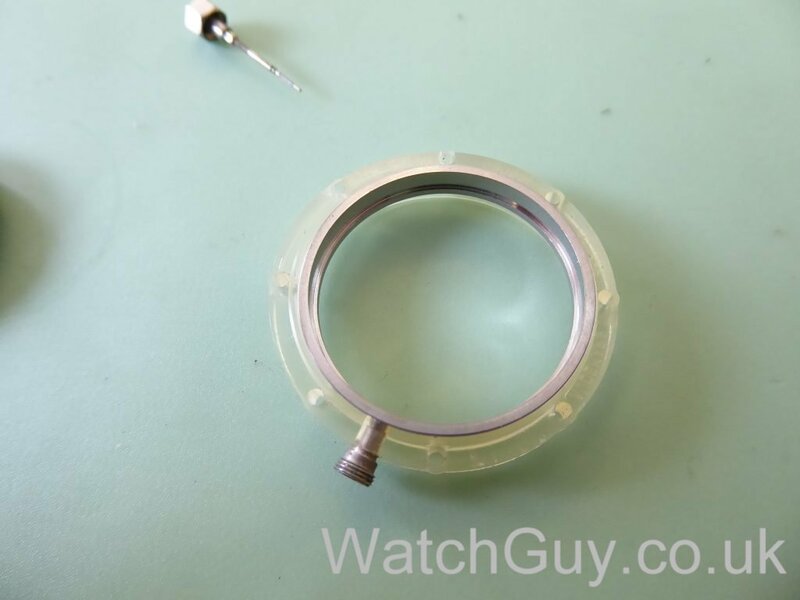 The bezel has a gasket between the crystal and the bezel ring, which is held in a groove in the crystal and the bezel. 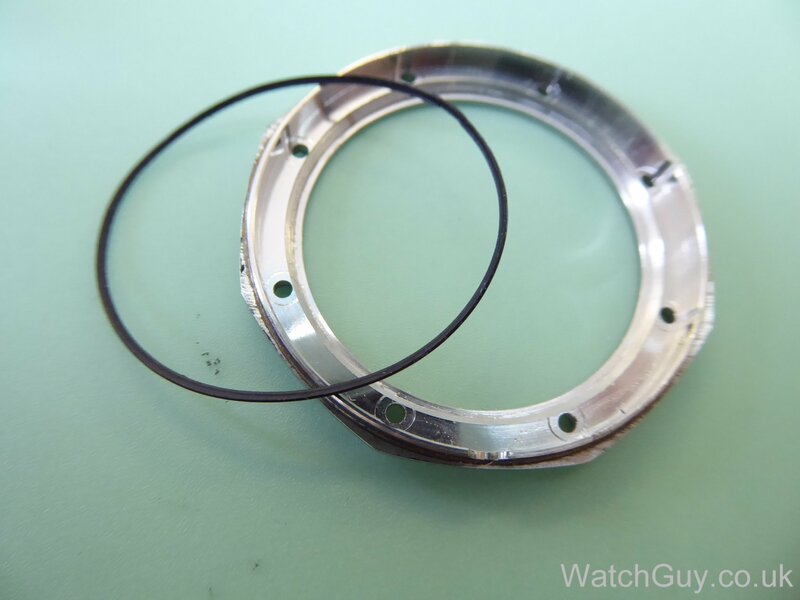 And here is the case ring with outer rubber ring. 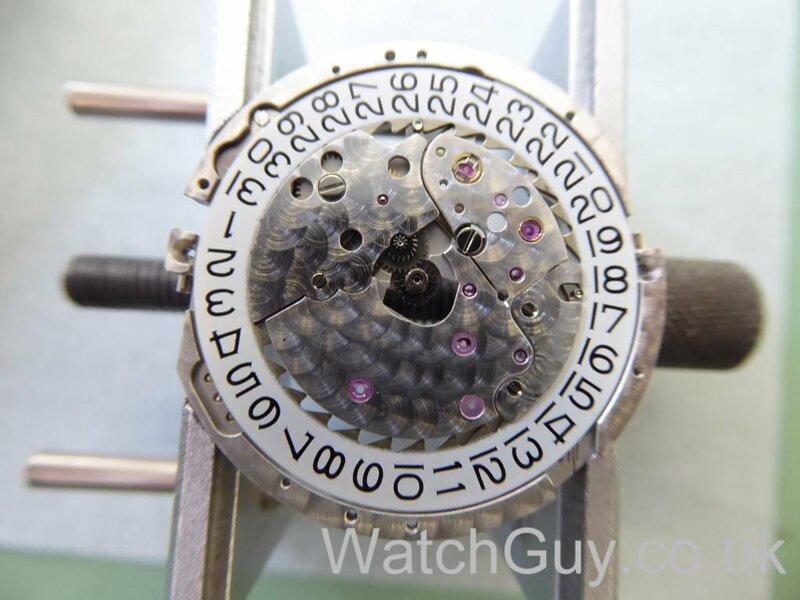 This outer ring is pressed against the case and on the other side against the crystal, which provides the waterproofing. 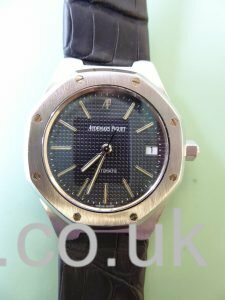 Unfortunately, AP doesn’t sell parts to independent watchmakers, so I will have to reuse the ring, rather than replacing it. 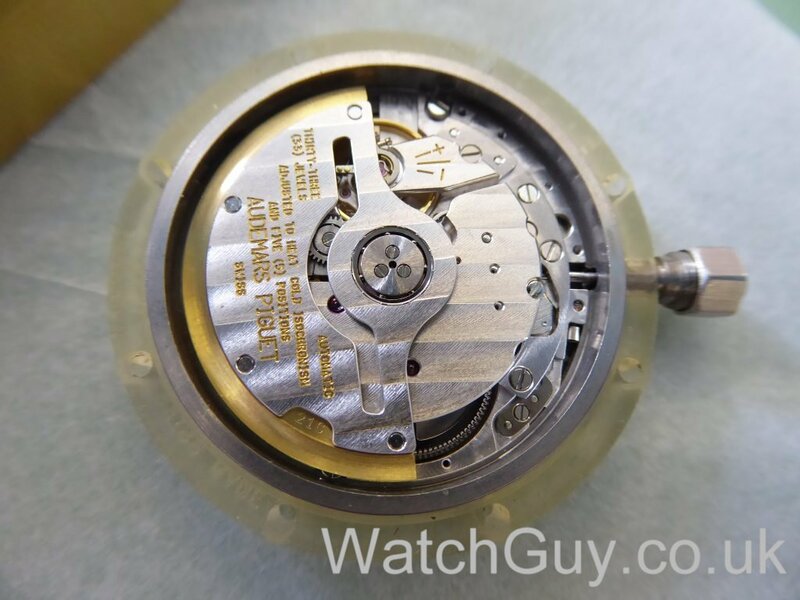 Nice dial in very good condition. And here is the calibre 2125. It beats at 6 beats/second, so nothing spectacular there, but it’s main merit is how thin it is. At 3.5mm including the rotor, quite an achievement. 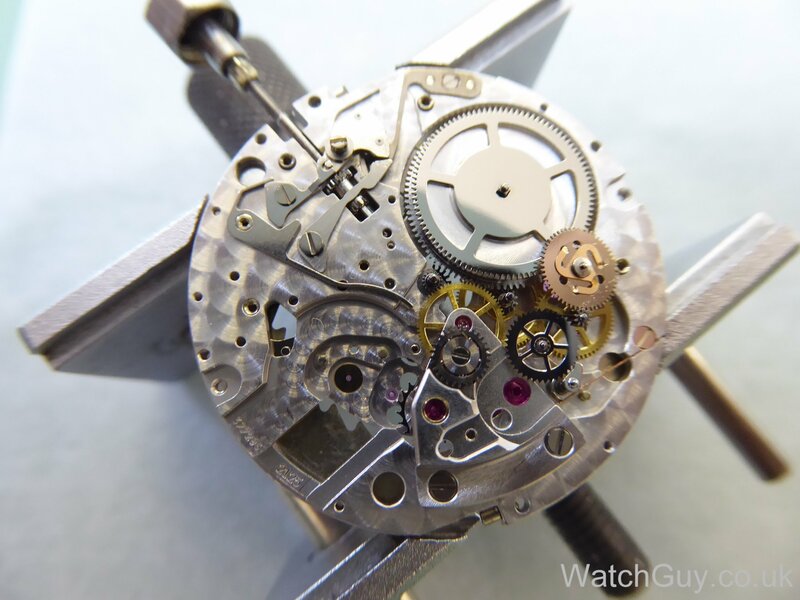 A beautiful movement indeed, and nicely decorated. 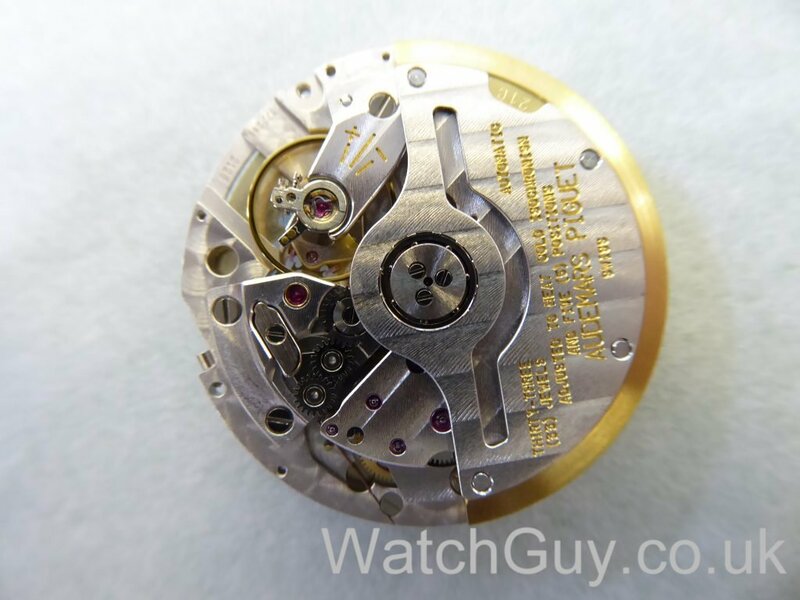 The rotor has a 21 carat gold weight attached to it. 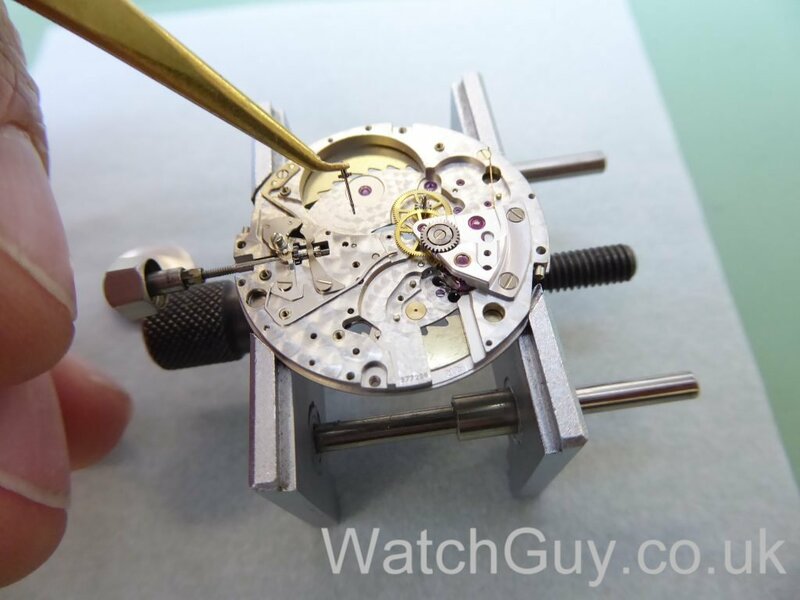 As gold is very dense, you get a lot of weight per volume, which is important when making a thin movement. 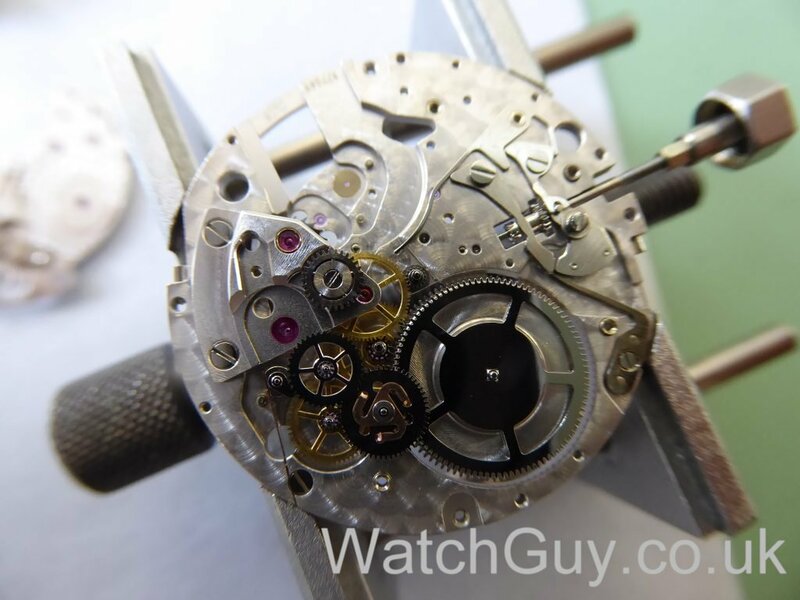 With the rotor removed, you can see parts of the auto winder gears. The rotor engages with an intermediate wheel that sits in a ball bearing, which in turn drives a wig-wag wheel providing bidirectional winding. Time to take the movement apart and see what lurks inside. 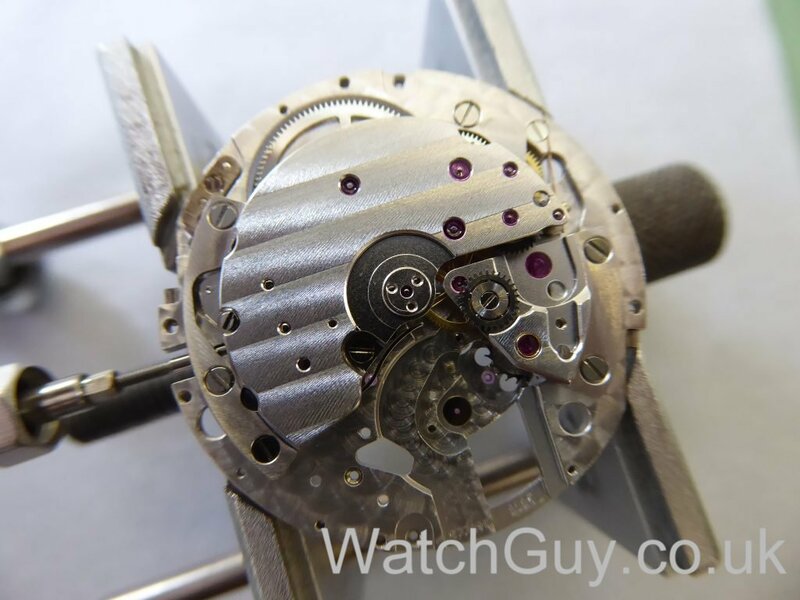 With the barrel bridge removed, you can see the rest of the auto winder gears. The wheel with the 3 spoke “Isle of Man legs” construction on top provides a clutch that engages in one direction, and freewheels in the other. 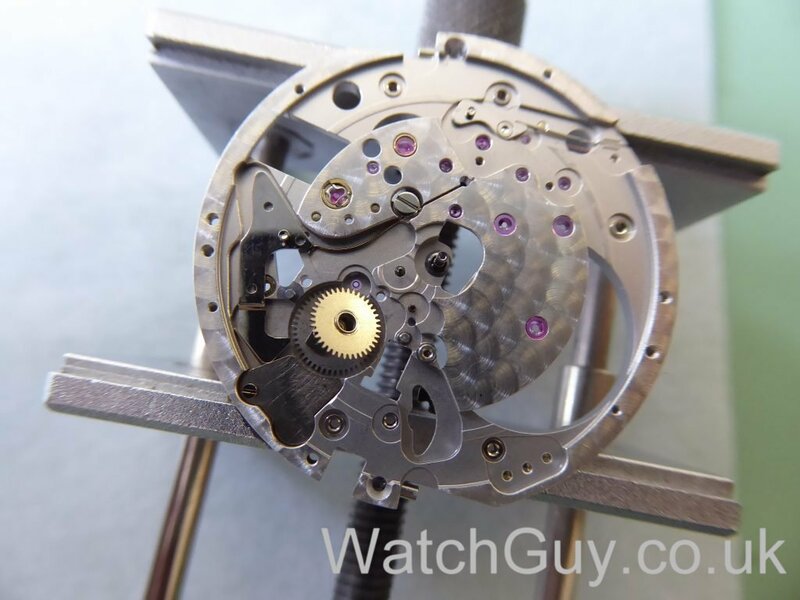 This allows manual winding without turning the oscillating weight. The top plate is taken apart, and I will turn my attention to the bottom plate. The bottom plate with the date disc. The setting and date mechanism. Only the date wheel and the date setting lever left. All the parts are cleaned, and ready for reassembly. To make reassembly easier, I order all the screws on a piece of rodico. The keyless works sit on the top plate, and not on the bottom plate as usual. This is done in order to make the movement thinner. The gear train and wheel bridge are in place. Now the barrel bridge and the auto winder gears go in. That looks so much better than before! 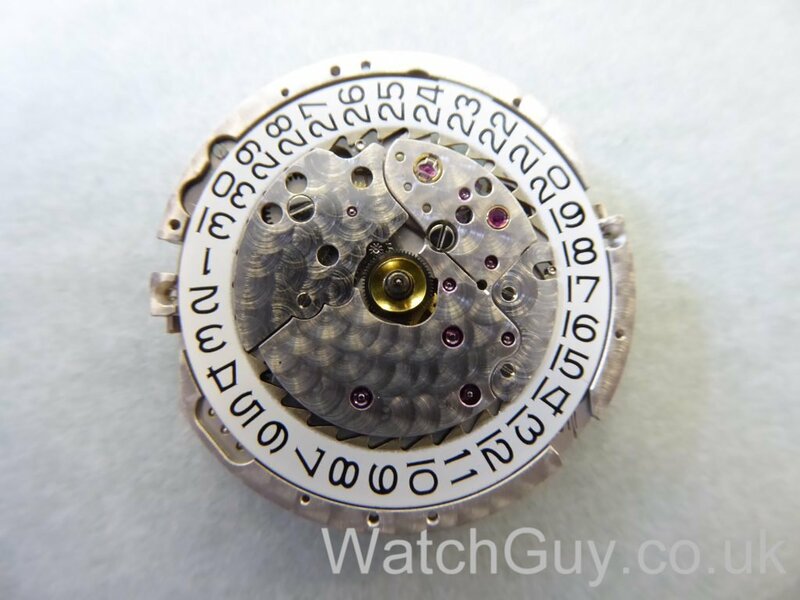 With the movement ticking as it should, I can start putting the bottom plate back together. 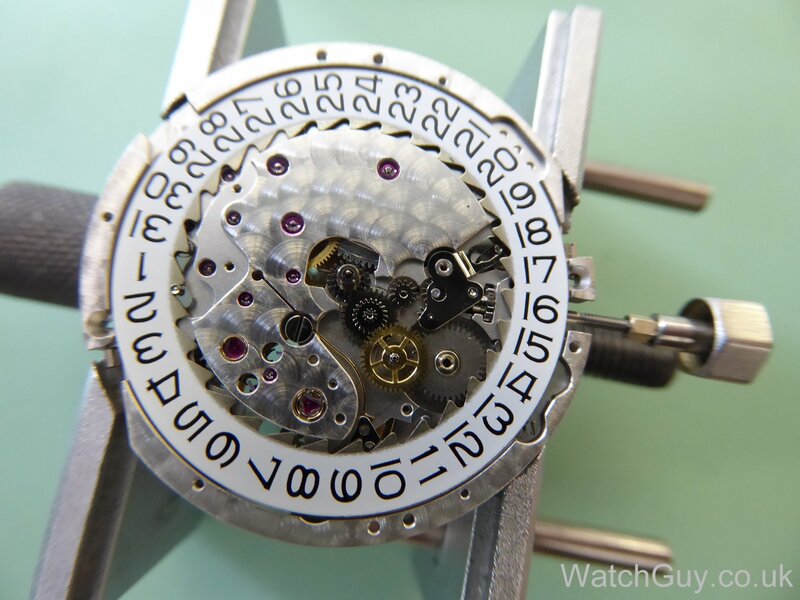 The date mechanism is visible here before putting on its cover. Dial and hands are back on, and it’s time for casing. 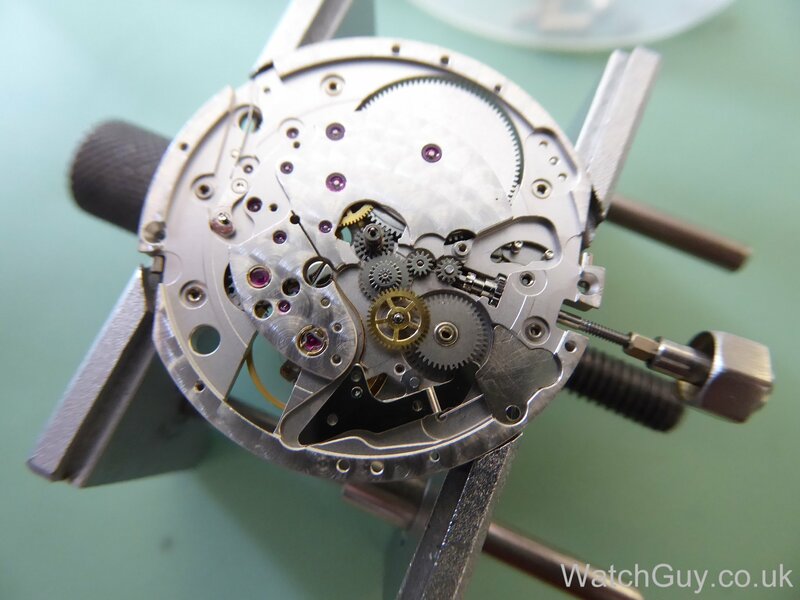 The movement goes back into the case ring. With a new strap, the watch looks very nice indeed. 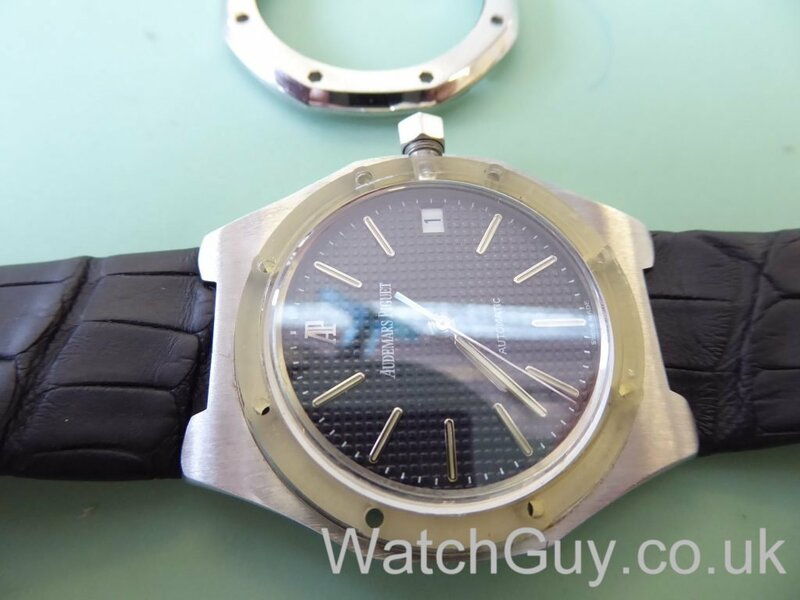 Have a 17+/- year old Stainless Steel Royal Oak 14790ST (2225 calibre) that was purchased new. Have had no service on it since purchase. 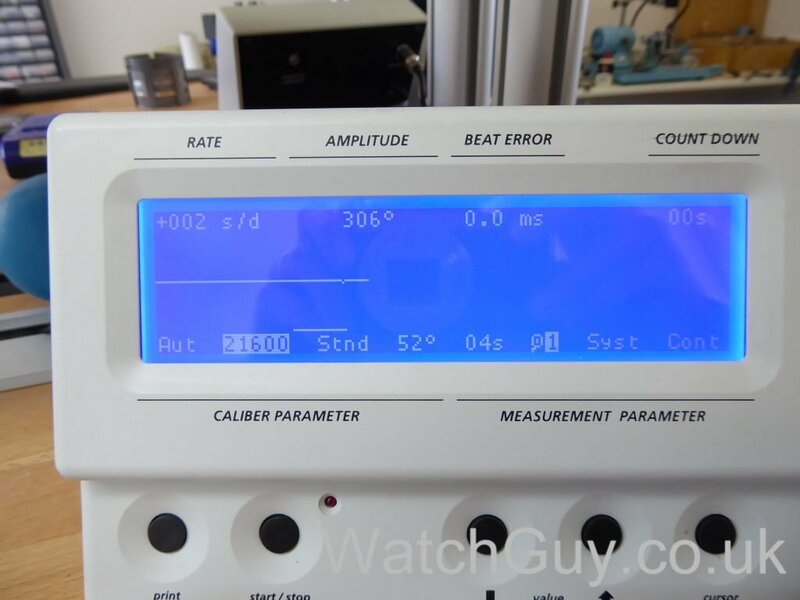 Noticed battery reserve depletion and loss of a minute every 5 days for 5 years. Now, watch just stopped dead. Since >15 years since manufacture, AP Repair states “no parts”. Estimate they gave me to repair was eye watering high $$$. First, should not this watch last much longer? Second, do I have any other options aside from letting them replace the movement, central fourth wheel, etc for an insane amount of money? You mention the word “battery”… Surely the 2225 is a mechanical movement. 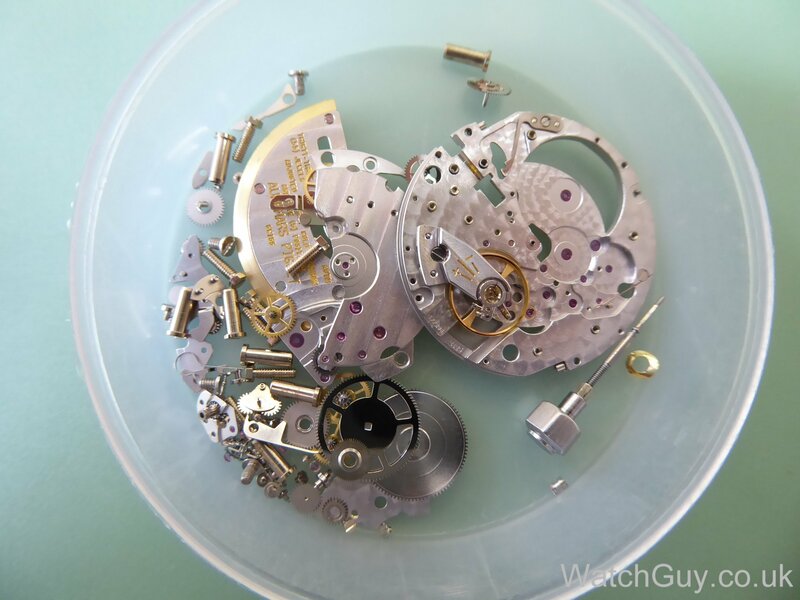 A mechanical watch needs regular servicing, and your watch stopped because you didn’t do that. That said, AP should have the necessary parts to perform a service and repair, and I presume that is what they quoted for. The problem is that you bought a watch from a manufacturer that doesn’t sell spare parts to independent watchmakers. So they can do as they please, and that’s what they are doing. Thanks providing this guide on Audemars Piguet. 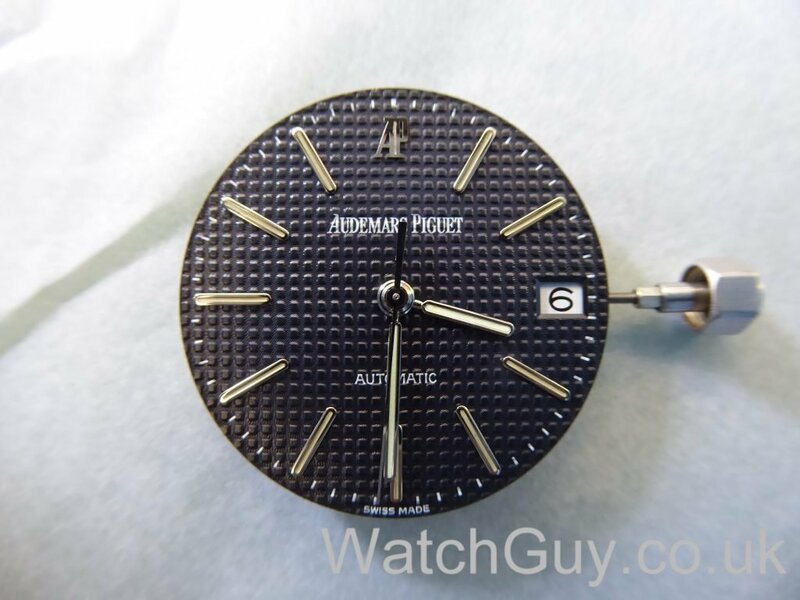 Great blog, really amazed by these stylish and elegant Audemars Piguet designs. Great anatomy! Thanks to add such a useful knowledge to watch lovers like us. 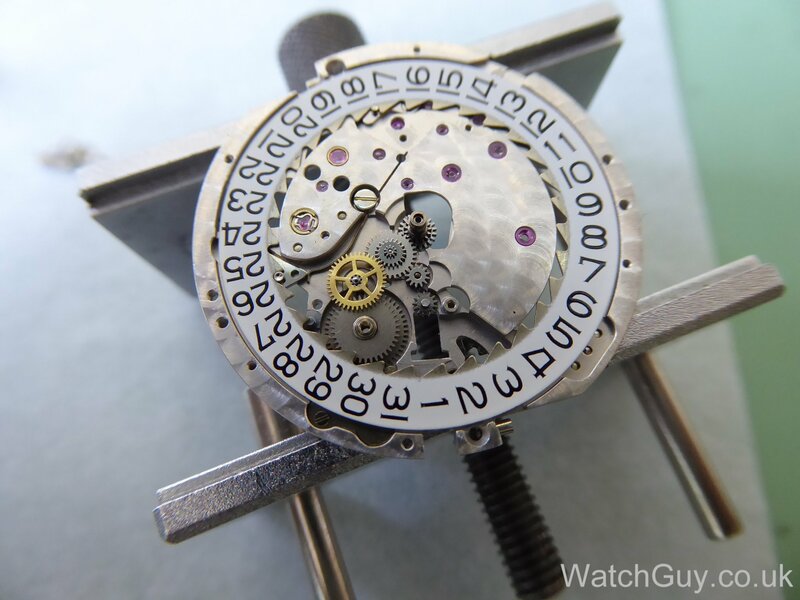 Would you happen to have a datewheel for that calibre ? If so, how much would it cost ? That’s amazing performance and regulation. Hi! Thinking about getting one of these, pre-owned of course. Is it difficult when it comes to changing straps? Do you, for instance, have to use custom straps? Don’t. 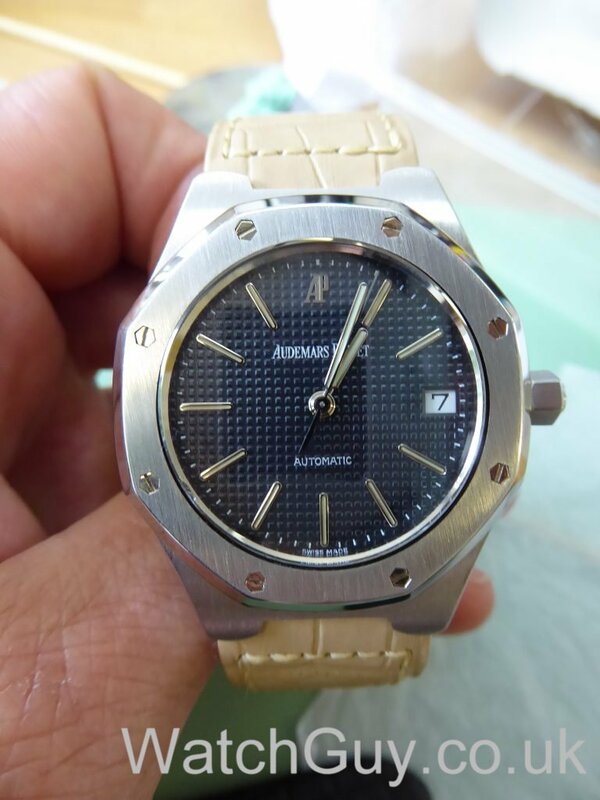 No parts available whatsoever, and huge service bills from AP. Great tear down and always enoy readings your blogs. 1 thing I just do not understand is why you thow all the parts in 1 bin like that. It looks amateurish and you risc scratching bridges, mixing screws (yes they are in there) and bending dial washers. You should know better my friend! Don’t be so touchy feely and keep an open mind for positive criticism. 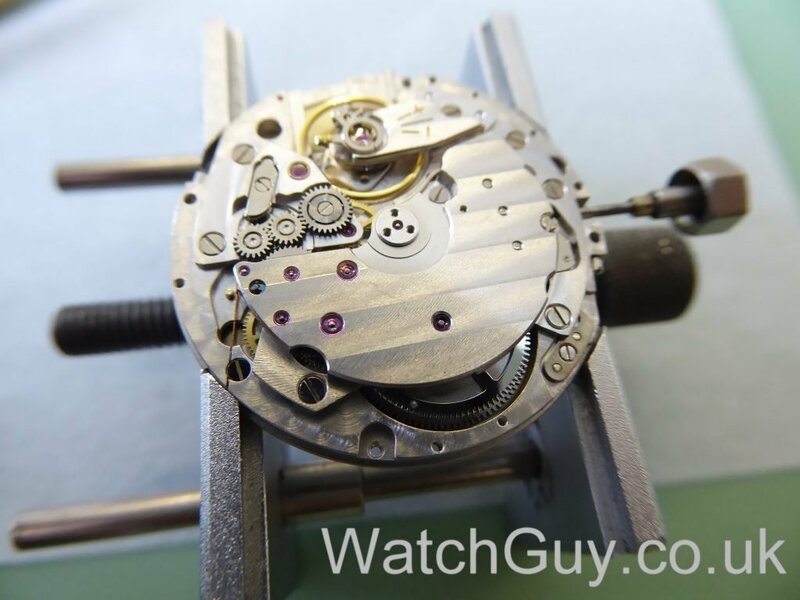 Just an observation and point of attention from a fellow watchmaker. You comment was a bit more than positive criticism I’d say. I believe there is a single bin for the teardown. when washing the parts, I believe they go in their separate places în the baskets. @Christian – love your blog. 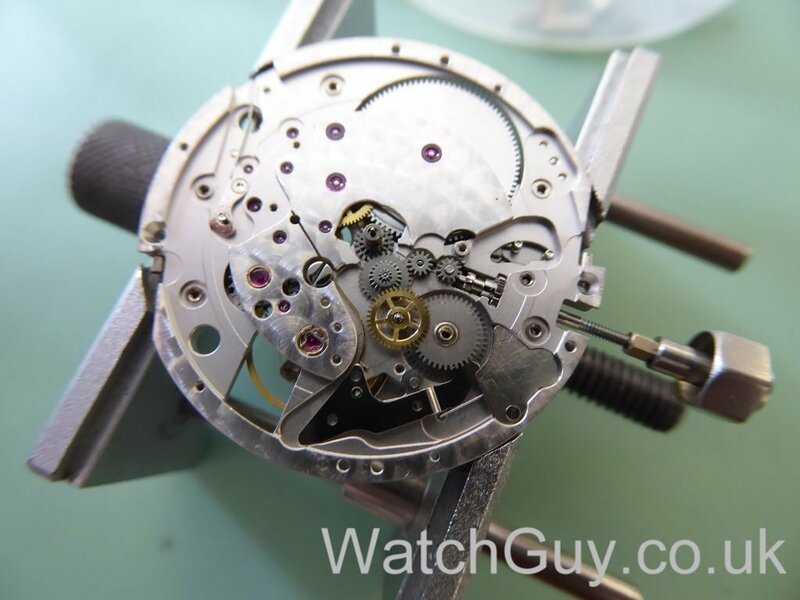 Question: when you receive a mainspring from Generale Ressorts, do you lubricate it and then pop it in the barrel, or is there enough oil on it directly from the factory? I’ve always put a blob of 8200 grease on the spring once it’s in the barrel but i wonder if it’s necessary? All GR mainsprings come pre-lubricated. They use a waxy white lubricant, and it doesn’t like oil. So I just lubricate the barrel arbour top and bottom with HP1300, and close the barrel. You also apply braking grease to the barrel wall if it’s an automatic. Regarding the rubber gasket it does not look so special to me. Not oversized or vey wide to me. I could imagine some properly stocked material houses have a close fitting size? You are looking at the wrong part I think. This rubber gasket is not standard at all,and nothing else will fit. Christian – I’m sure a man of your talent and resourcefulness could machine a replacement. 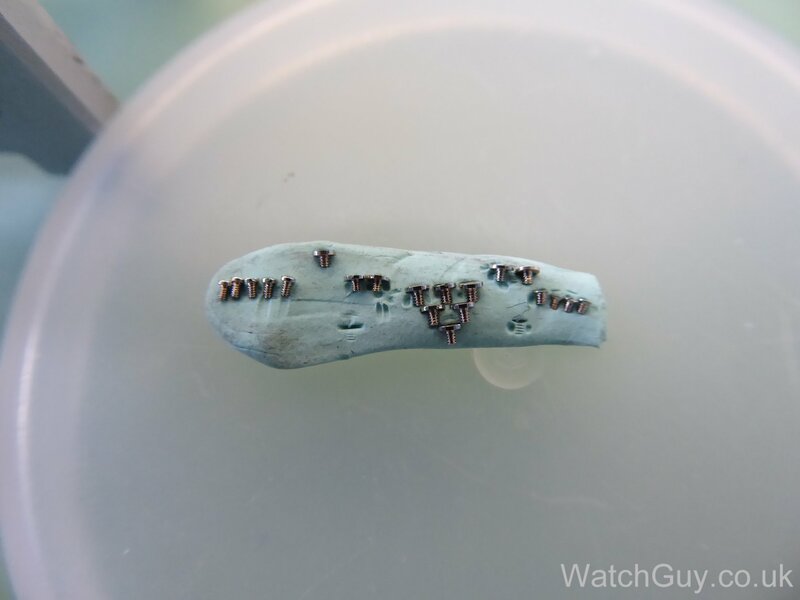 Rubber can be turned and drilled when frozen, but you will need liquid nitrogen to freeze it sufficiently and remember it becomes quite brittle. “Flashings” from the moulding process can also be machined off using a razor blade at room temperature. Not tried it personally, but info comes from conversations with a rubber parts supplier many years ago. 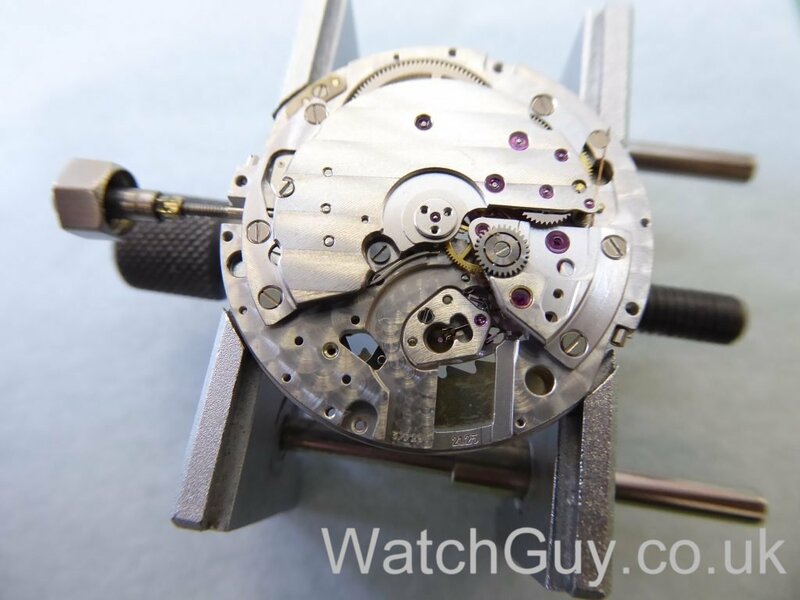 Could you please tell me where you found the mainspring? No problem; Cousins has it. They are one decimal place out listing its thickness. Another superb job. Thanks for showing us how this watch is taken apart. I agree with your gripe about the rubber case ring and wanting a watch that will last a long time. 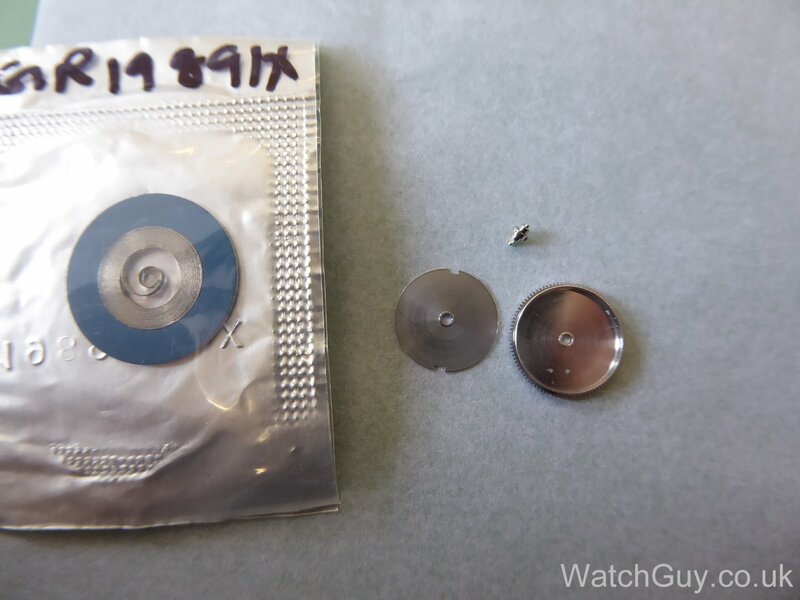 Any reason not to use threadlocker on the screws the case ring? I wouldn’t do that… it’s not needed, and you might break the screws when you try to open the case again. I don’t like the stuff. You don’t 😉 The screws that you can see in the case back are actually nuts, and it’s them that you turn to open the case. The caliber 2125 is based on a Jaeger leCoultre caliber (888). All in all a very nicely executed piece I would say! I had the exact same thought about the 3D printer, Anders!